The new xavior school for higher learning, the issue begins with a dazed and confused Quintin quire living out a series of events in his head as the Stephord sisters and Cyclops watches on. Later that day, the paralyzed Quintin quire lies on a table as the sisters gain Intel from his head. Cyclops enters quires mindscape and We discover that Younge holds a weapon which slipped through the cracks of time. The phoenix blade gives Younge a small portion of its powers. 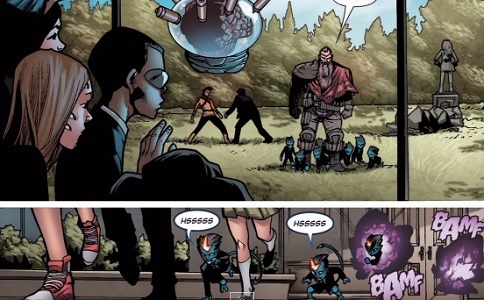 In Fantomex’s the world, Evan demands to be set free from his uncle so he may help his friends at the school. Fantomex presses a button and manages to put Evan under control. Read Comic Books Online: The phoenix corporation. After a battle with the phoenix followers, Wolverine states that he is too weak to go against Faithful John. Instead he sends the strongest person he knows. The two shares a kiss and storm flies off as wolverine hunts down Younge. A weakened wolverine finds his target and after a small discussion, Younge brings out the phoenix blade which shines bright and shows Logan a small glimpse of Younge’s past. Please Click Here To Read More Comic Books Online. Read Comic Books Online: The scene jumps to the jean grey school of higher learning. The battle continues between the students and faithful john. Idie won’t believe john and crushes him with an iceberg. Julien sides with faithful john and an argument ensues between him and rockslide which ends with a battle between friends. John gets up and sends the Bamfs to hunt down EVAN. He enters the school but Hisako creates a body armor and attacks. Suddenly, a Bamf teleports in and flushes her out. Meanwhile, another Bamf discovers the world. The Bamf reaches for it but Fantomex picks it up stating that this one belongs to me. So this was a very quick issue and not much really happens much like the previous issues. The story is moving a bit slow for my taste. I was hoping to see more development from Evan but instead we are treated to more of the phoenix corporation’s Younge, a mysterious character that i don’t really care to much for. I do enjoy the beginning where we see Quintin quire day dreaming. He is always fun to read. I did notice one thing: take a look at the stephord sisters in the back. Notice something off? From what i understand, the two sisters change hair color and style a few issues back. Right now in uncanny x-men, we still see the sisters with different hair styles. The devil is in the details. The writers forget about this bit? We also get treated to a heartfelt talk between quire and Cyclops. Cyclops offers some mentorship to quire and i thought that was pretty cool. But i do enjoy the ending where we see a shot of fantomex. Hopefully he can be a more prominent character at the jean grey school. Alright so we get a nice scene with even and fantomex in his artificial world. 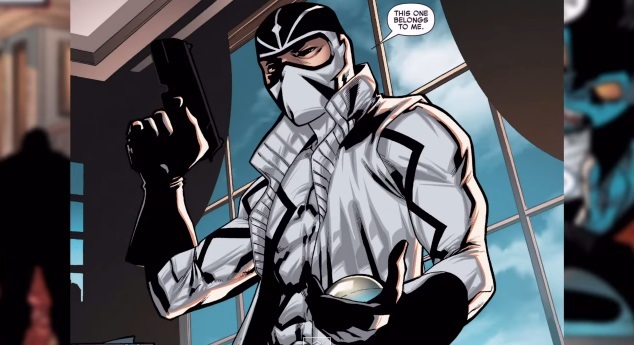 For those who don’t know, fantomex has in his possession a small half globe that he can access. Within the globe is a world that he can manipulate the landscape and time. Fantomex is like the god of this little piece. After Apocalypse defeat, he got reborn and instead of killing this Apocalypse child, fantomex sees an opportunity to raise the boy named Evan in a controlled world to make this child grow up with proper upbringings and could one day be a force for good. Even states that he wants out of the world to help his family. So far, we still get a very caring kid Apocalypse so it makes the drama that much sweeter when he goes dark side on everyone. Read Comic Books Online: Alright so I have a question for you. Who do you think is the more interesting character right now? Quintin quire or kid Apocalypse. For me it has to be kid Apocalypse. I love reading the fall of a hero and his journey back to the light. So thank you so much for watching my review of wolverine and the x-men. If you enjoyed this video, please like, subscribe and ill see you next time in wolverine and the x-men issue 5.